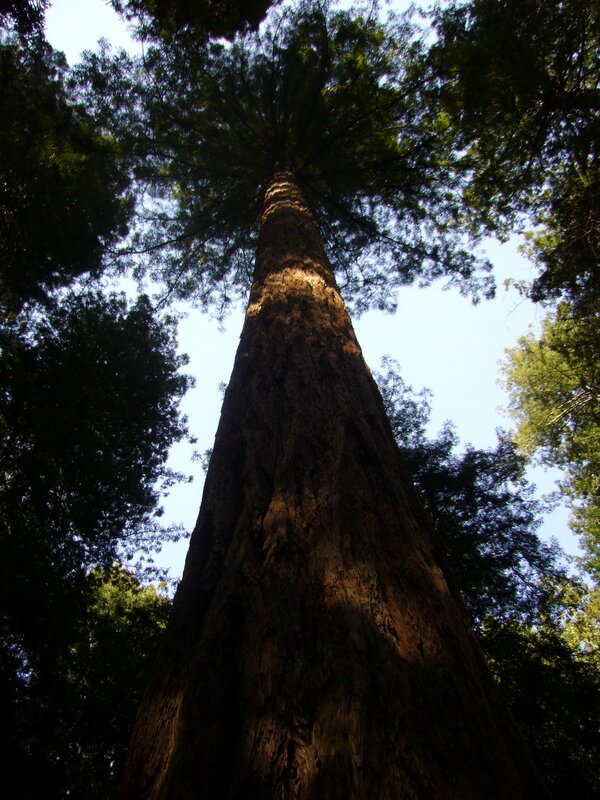 Coastal redwood (Sequoia sempervirens) is the tallest type of tree in the world, with maximum recorded heights approaching 380 feet. This majestic conifer grows only along the Pacific Coast in a narrow strip from Monterey to Oregon. 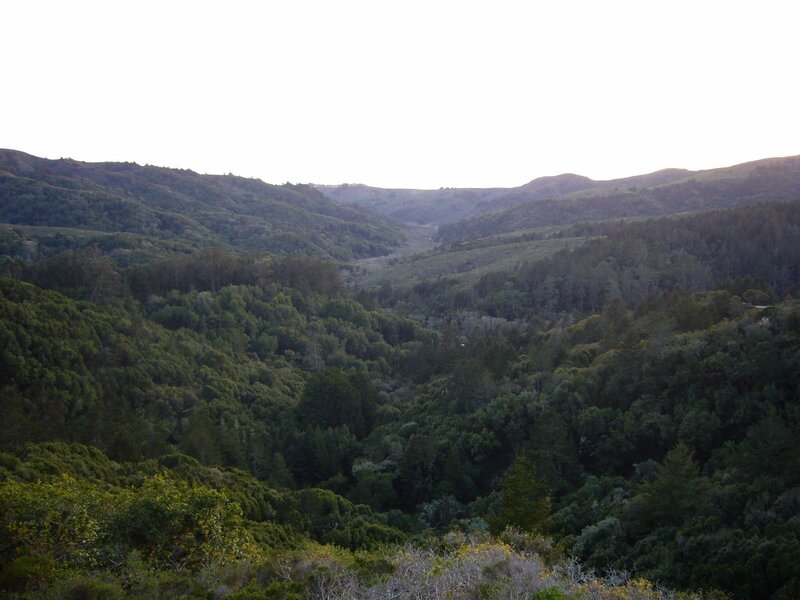 Most of the estimated 2 million acres of original redwood forest are now gone — victims of the saw! 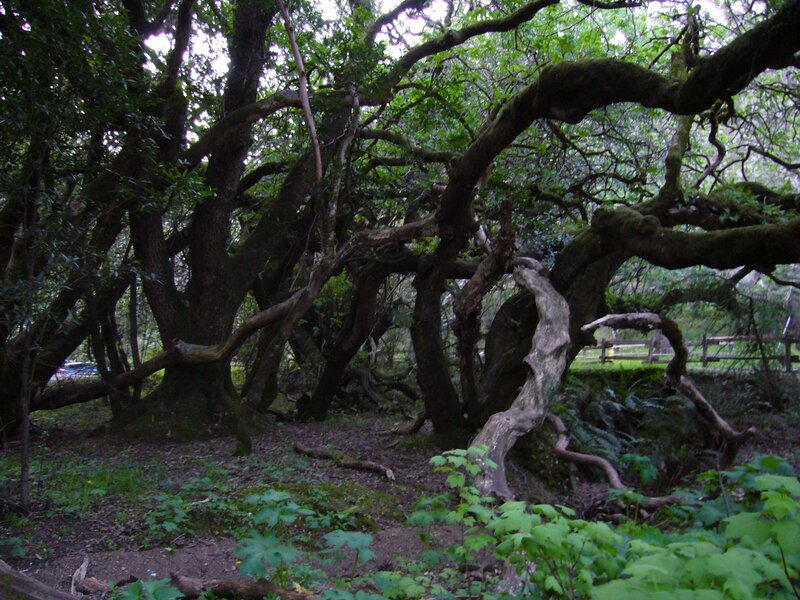 One of the small groves that managed to escape this fate due to its relative inaccessibility grows along Redwood Creek and adjacent slopes in what is now Muir Woods National Monument. At heights approaching 260 feet, the redwoods growing here are not the tallest to be found; however, their proximity to San Francisco (just 15 miles from the Golden Gate Bridge) makes them the most heavily viewed examples of this ancient tree. 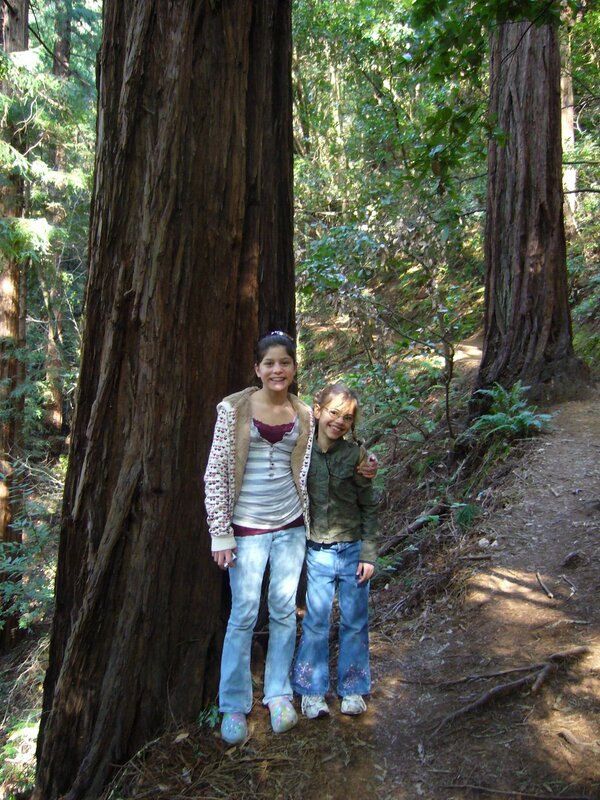 Lynne and I visited Muir Woods a few times in the 90’s after moving to Sacramento — today (3/20) was our first visit since then, and the first ever for Mollie and Madison. In addition to getting to see these marvelous trees once again, we were also treated to a spectacular display of spring wildflowers. We began our hike on the main paved trail. This is where most visitors confine themselves during a visit to this place, so the picture here documents a rare sight — no people! I apologize for its lack of focus, a consequence of the limitations of my little point-and-shoot camera in the limited amount of light that makes it through these towering trees during late afternoon. Standing beneath one of these trees and looking up is a lesson in insignificance — the feeling one gets looking straight up the trunk of one of these giants cannot be adequately captured on film (er… microchip). We quickly tired of the crowds and decided to hike up the Ocean View Trail, which climbs quite steeply up the east side of the valley. This marvelous trail was nearly devoid of people, and we found ourselves winding through thick, dark, cool forest with numerous side ravines. 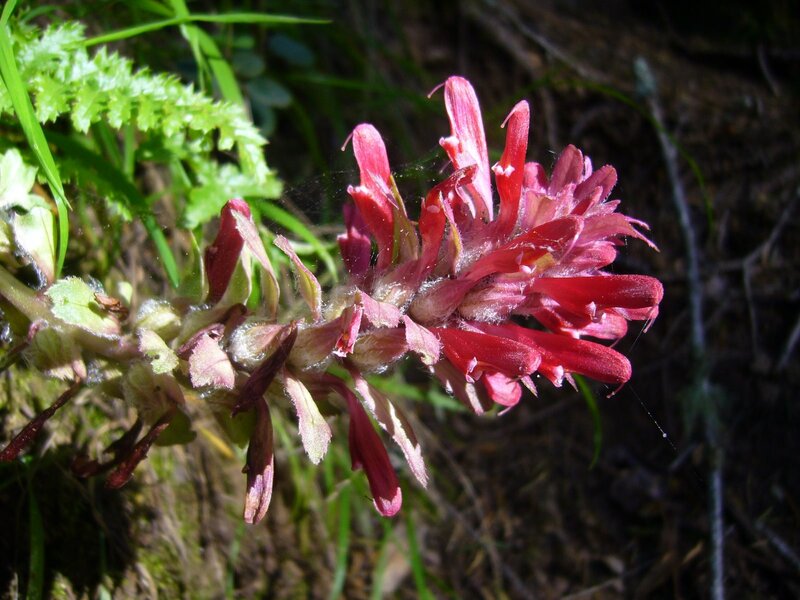 The lower elevations of the trail were dominated by redwood trees and a spectacular array of spring wildflowers. 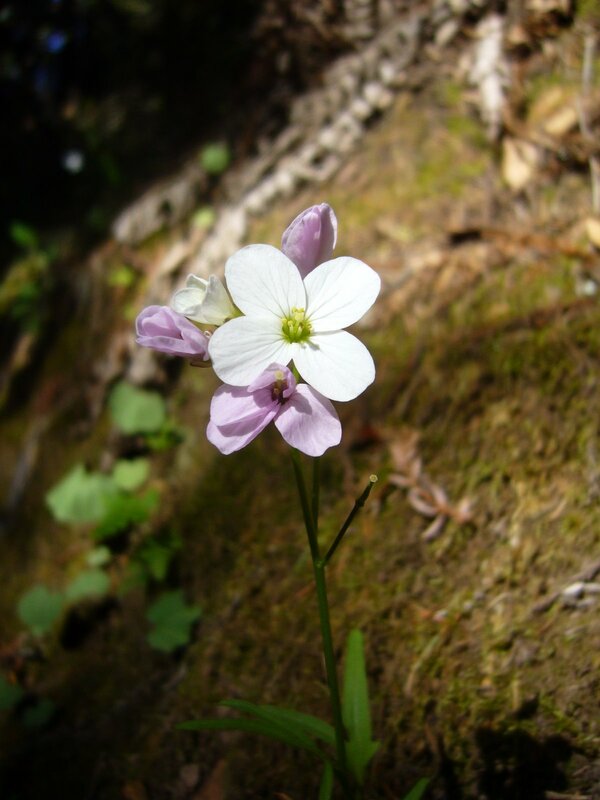 Among the most common was California toothwort (Cardamine californica [=Dentaria californica]), a member of the mustard family (Brassicaceae). 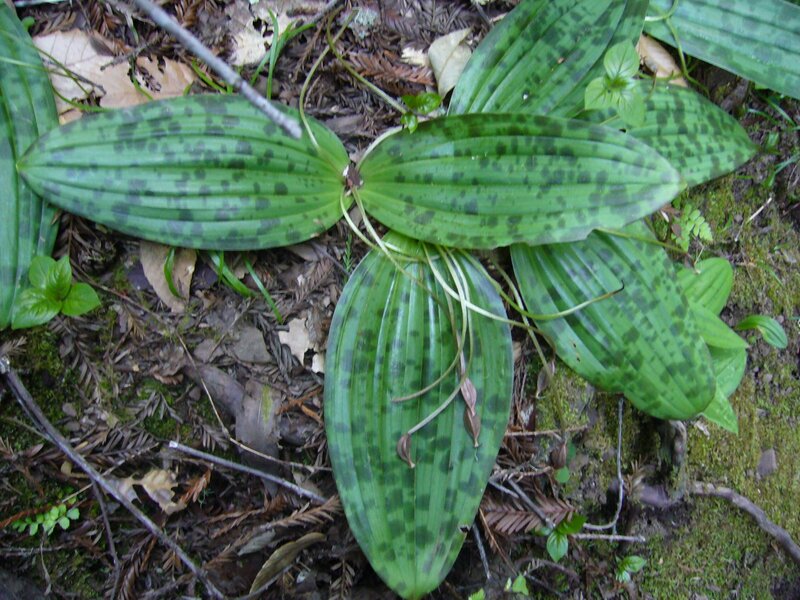 I noticed that the leaves at the base of the plant were broad and oval, while those arising from the flower stalk were slender and lanceolate, often divided into 3 leaflets. Wake robins (genus Trillium), belonging to the lily family (Liliaceae, sometimes separated into the lily-of-the-valley family, Convallariaceae), are among my favorite wildflowers. 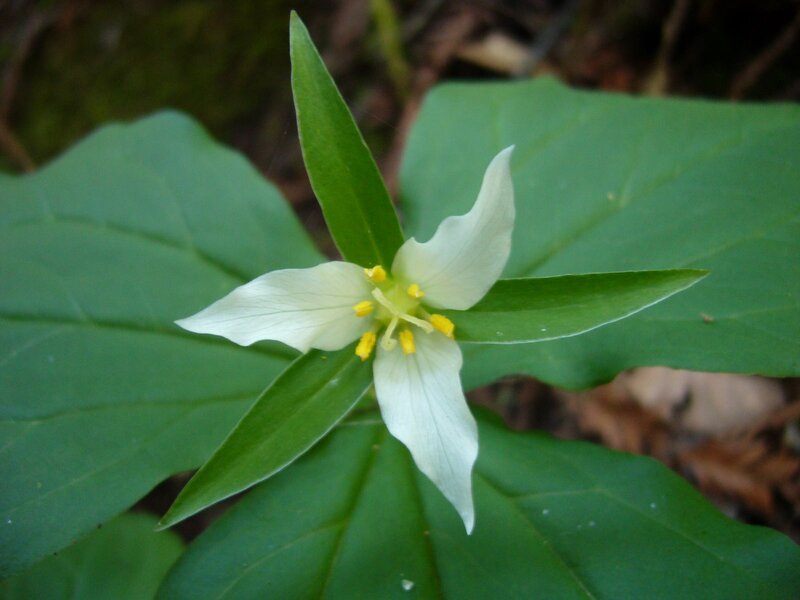 We soon noticed Western wake robin (Trillium ovatum) growing commonly in shaded areas along the trail. We were also seeing some purple-flowered wake robins — at first I thought they were a different species, but it soon became apparent that these were older Western wake robin flowers, which change color from white to purple as they age. 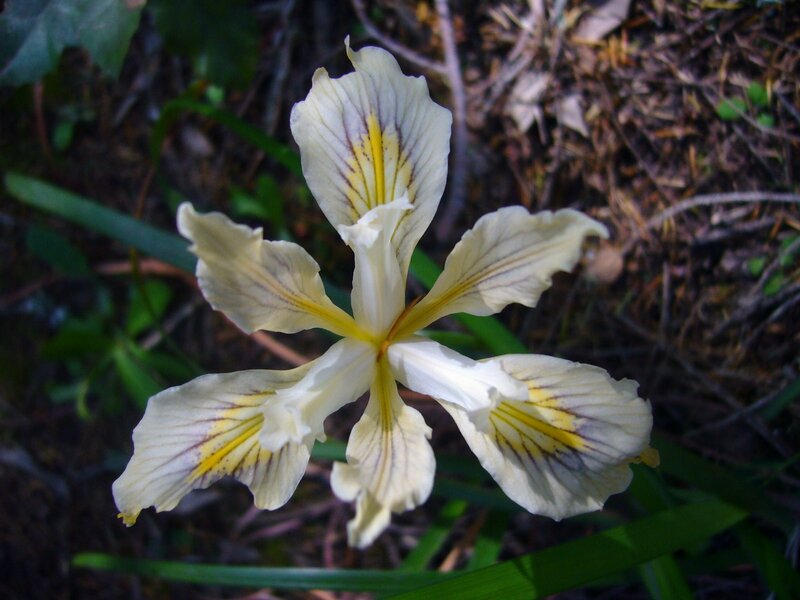 A little further up the trail we began encountering small patches of Mountain iris (Iris douglasiana, family Iridaceae). Flower color for this native species ranges from cream-white to lavender, but all of the flowers we saw were of the white variety. We saw this fat Solomon’s seal (Maianthemum racemosum ssp. amplexicaule [=Smilacina racemosa var. amplexicaulis]) growing in one of the cool, moist, side ravines. This is another member of the Liliaceae (sometimes separated into the Convallariaceae). The large, oval leaves clasping around the distinct, unbranched stem were almost as attractive as the flowers, which apparently give rise to bright scarlet berries in the summer. 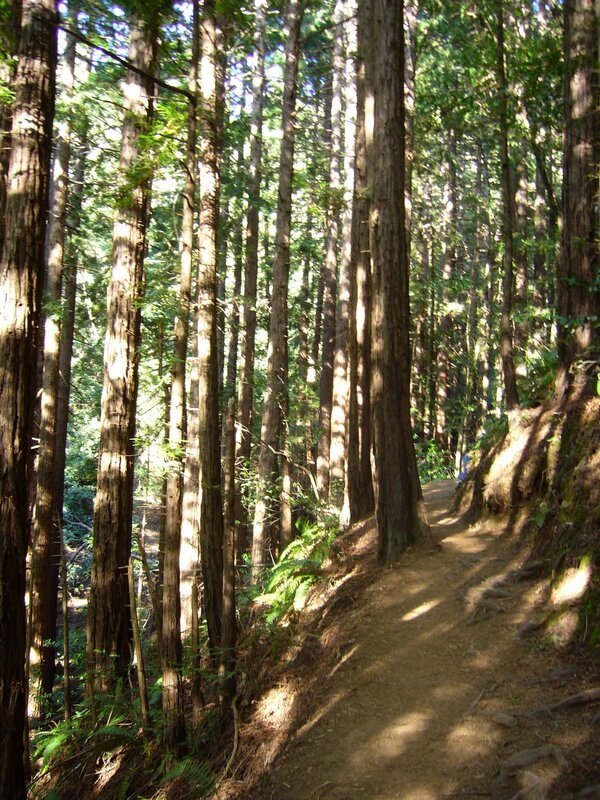 In the middle elevations the redwood forest transitioned to drier oak woodland containing a mixture of Douglas-fir (Pseudotsuga menziesii), Pacific madrone (Arbutus menziesii), bigleaf maple (Acer macrophyllum), and tan oak (Lithocarpus densiflorus). Some of the Douglas-firs were enormous. Indian warrior (Pedicularis densiflora) is a member of the figwort family (Scrophulariaceae, sometimes separated into the Orobanchaceae). This plant, with its striking bright red flowers and finely divided, fern-like leaves, is a facultative parasite on the roots of other plants. Apparently, the genus name refers to an old superstition that sheep could become infested with lice if they ate this plant. The juncture of the Ocean View Trail with the Lost Trail was closed, so we backtracked down the 1+ miles back to the main paved trail. By now it was fairly late in the afternoon, and the crowds had thinned considerably. Having gotten lots of good views of the giant trees, we began turning our attention downwards to the smaller understory flora. 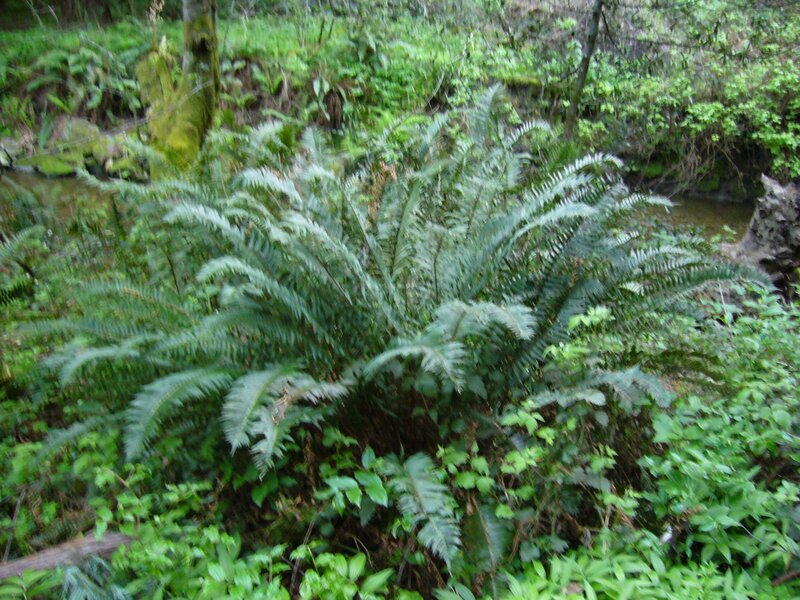 Ferns, of course, are a dominant component of this understory, especially along Redwood Creek. This large specimen may represent Western sword fern (Polystichum munitum) (family Dryopteridaceae), which can apparently be distinguished by small hilt-like projections from the base of the pinnae (leaflets), but I couldn’t get close enough to see for sure. 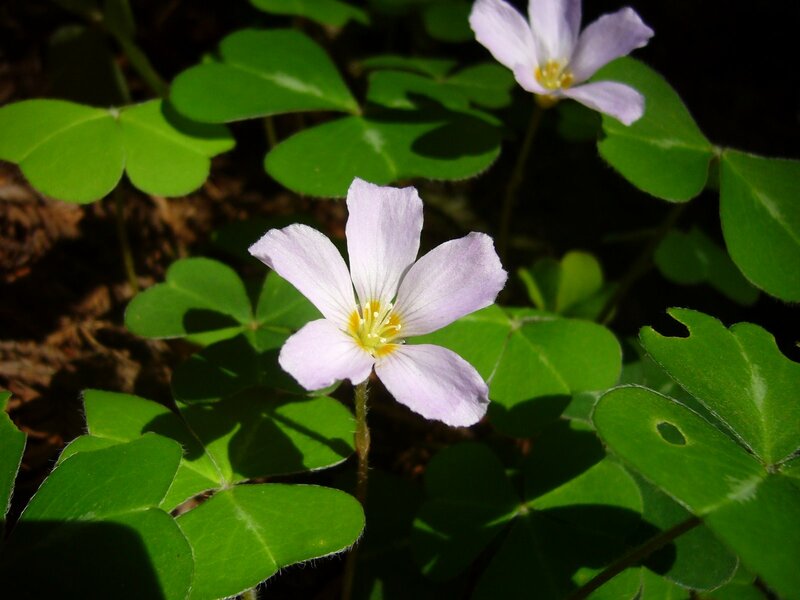 Abundant on the ground in the valley was redwood sorrell (Oxalis oregana), a member of the family Oxalidaceae. In places this plant covered the ground in thick carpets. Among the more interesting plants we saw in the valley was California fetid adder’s tongue (Scoliopus bigelovii), yet another member of the Liliaceae or Convallariaceae. I wasn’t sure what this plant was at first, despite its highly distinctive, glossy, mottled foliage. We were too late to see the blooms, which apparently have a fetid odor to attract flies for pollination, but did find the maturing pods on their slender, drooping stems. Close to the creek’s edge we saw this colony of horsetails (Equisetum sp. ), primitive plants in the family Equisetaceae. Members of this group belong to one of the most ancient lineages of vascular plants, dating back to the Devonian period (416-359 million years ago). Their Paleozoic ancestors (Calamitaceae and Archaeocalamitaceae) were giants, reaching heights of 50 ft or more, and were major components of the Carboniferous swamplands. Along with lycopod trees (Lepidodendrales), they were important contributors to coal formation and, like the lycopods, became extinct by the mid-Permian (~270 million years ago). 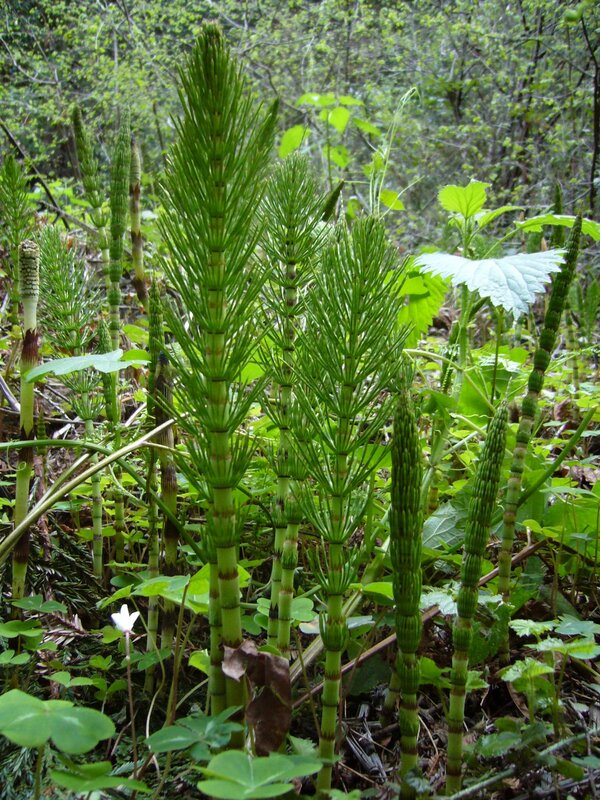 The genus Equisetum represents the only surviving descendants of this lineage. Unlike their extinct progenitors, these small, herbaceous plants rarely exceed 4 ft in height; however, they share many of the same characters such as articulate stems with microphylls arranged in whorls. Recent phylogenetic studies, using both molecular and morphological characters, suggest that horsetails, together with ferns, form a clade representing one of the three major lineages of vascular plants (Pryer et al. 2001). 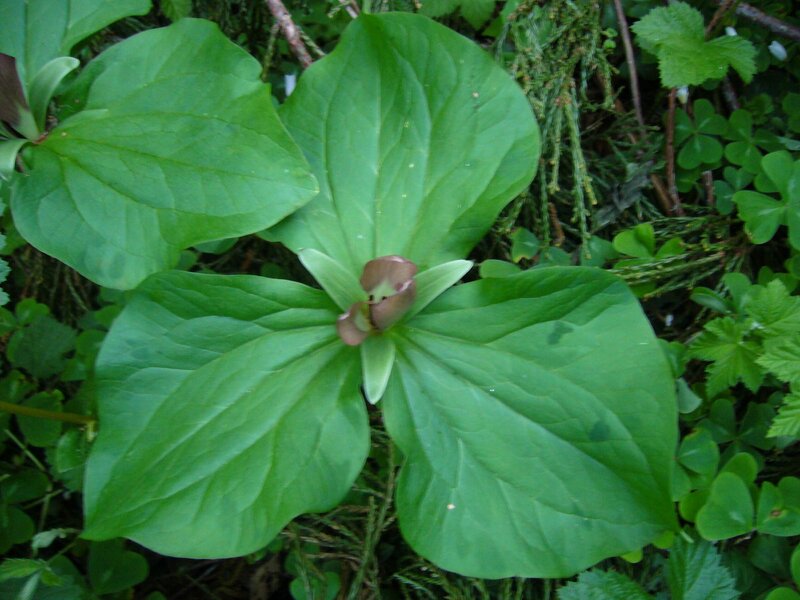 Nearby we saw a patch of Giant wake robin (Trillium chloropetalum) in flower. These were taller than the California wake robins we saw on the slopes of the Ocean View Trail but similarly characterized by a whorl of 3 leaves and flowers composed of 3 erect petals. Mature flowers darken to a deep red purple, so it seems these plants had just begun flowering. Muir Woods appears to be a good place for observing a diversity of Convallariaceae! 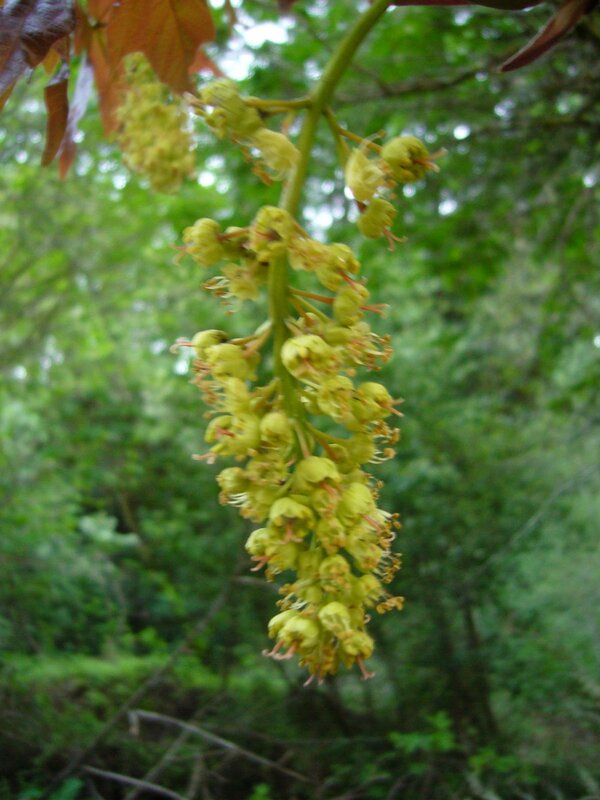 Also along Redwood Creek we found this bigleaf maple (Acer macrophyllum) in full bloom. As its specific epithet suggests, this maple has the largest leaves of any member of the genus — in this example the newly-expanded leaves were distinctly purplish. 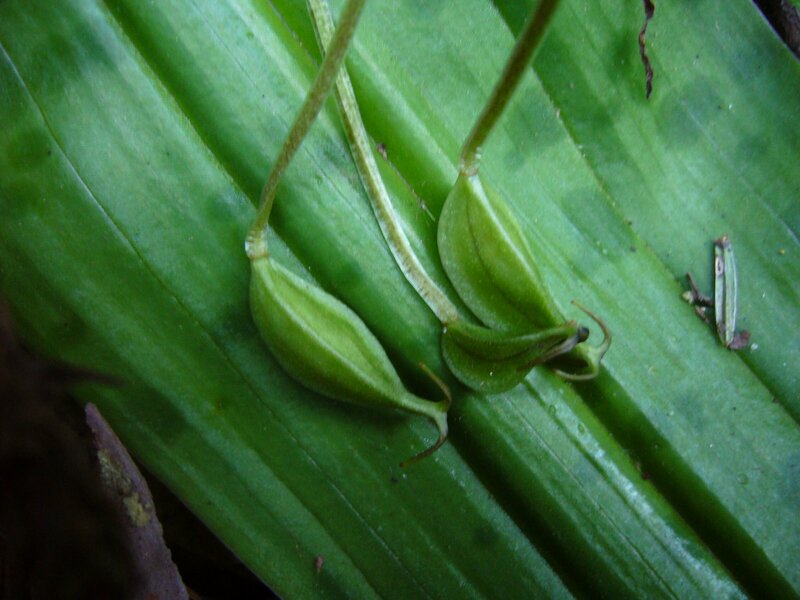 The picture below shows the greenish-yellow flowers (petals inconspicuous) produced on long, pendulous racemes. Interpretive signs along the paved main trail pointed out a redwood “family group,” formed by sprouts growing from the base of a larger tree. 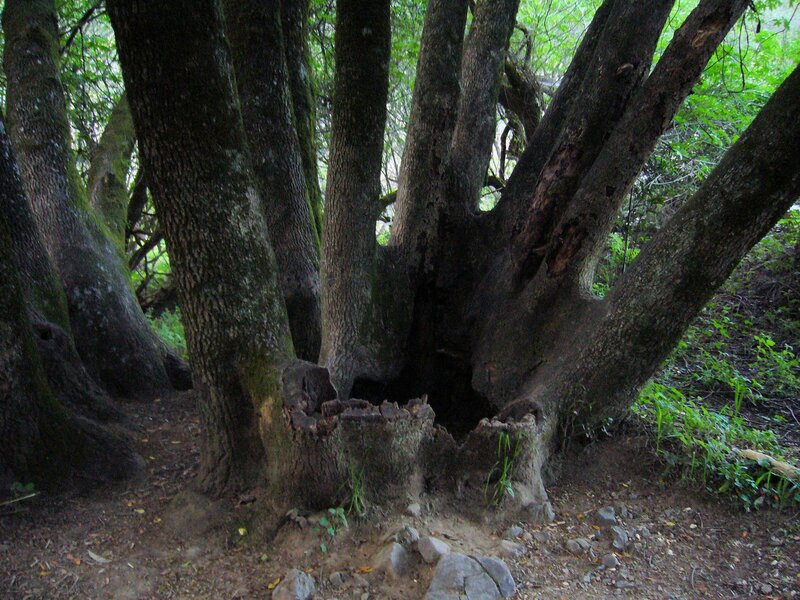 Eventually, the central “mother” tree died and decayed away, leaving a ring of offspring that mature into an enormous, characteristic circle of trees. This apparently also happens with other types of trees, though on a smaller scale, as demonstrated in this picture of an oak (Quercus sp.) family group. As the day drew to a close we found ourselves back in the parking lot, where this California icon, a clump of Coast live oak (Quercus agrifolia), was spreading its wide, majestic crown from multiple, twisted trunks and gnarled branches. Much too soon, it was time to leave this beautiful valley, but before heading back to Sacramento we stopped to take one last look down towards the valley and out to the Pacific Ocean from the Panoramic Highway. This entry was posted in Aceraceae, Brassicaceae, Convallariaceae, Cupressaceae, Dryopteridaceae, Equisetaceae, Ericaceae, Fagaceae, Iridaceae, Liliaceae, Orobanchaceae, Oxalidaceae, Pinaceae, Scrophulariaceae and tagged Botany, California, family, ferns, forest, Hiking, landscapes, nature, science, trees, wildflowers. Bookmark the permalink. Ted- Great blog you have here, I’ll add you to my reader. Looks like we share similar interests! Tom – thanks for the nice comment. Yes, I do think we share many interests. I’m anxious to see what we’ll both come up with as spring progresses. Stacey – the only thing better than hiking is hiking with my girls. I’m hoping doing this blog will make me an even better naturalist. I have to say again, your photographs are truly outstanding – thanks for stopping by. A very informative post and some great photos. Thanks for confirming the ID on my tiger beetle. It sounds like your family had a great trip. I too love love love beetles. They’re probably my favorite group, as I love taxonomy and there’s no shortage of it in Coleoptera. My husband is a botanist and says that technically the tallest tree is Eucalyptus regnans. Do you ever post beetle pics on your blog? The more I read your blog, the more I love it! You can’t get any better than entomology, and botany. Gosh, I wish my kids were old enough to take hiking. Amy — thanks so much for your kind words. Yes, beetles and botany makes any day a good one! I started this blog with the intention of posting mostly insect pics, but autumn was well underway here when I started the blog. Bugs were already in hiding, leaving hiking and botanizing to fill my time during the winter. As I began posting pics from some of those hikes, I realized how broad my natural history interests are and decided the blog should reflect that. Bugs are just starting to come out now, so expect more insect-related posts as we get into spring/summer. Interesting about Eucalyptus regnans – I did a little following up, and it appears your husband is right about it being the tallest ‘recorded’ tree, although the tallest currently living tree does appear to be a redwood (the Mendocino redwood). 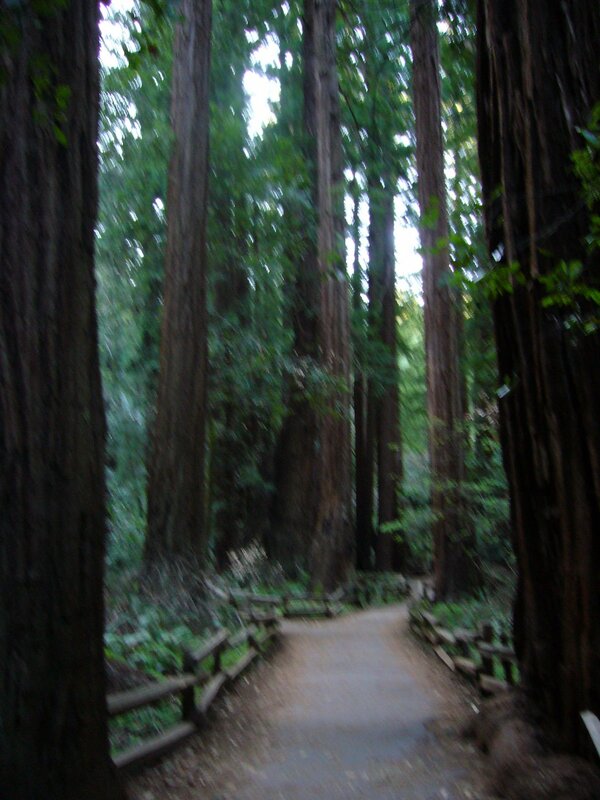 One article I found talked about redwoods being the tallest trees by default, since all trees taller have already been cut – sort of like shooting all basketball players taller than 6’2″ and then claiming volleyball players are the tallest athletes! Your kids will be old enough to hike before you know it – don’t delay on getting them started when the time comes. Some of the best times I’ve ever had with my kids are on those hikes, and you just don’t know how long it will last. We just got a sweet camera, a Nikon D80, and I hope to try out some insect pictures. We don’t have a macro lense but we do have a 1:1 that I hope will do some nice closeups. The macro just isn’t in the budget right now.